MyBitcoin was one of the earliest eWallet providers for Bitcoin. It shut down near the end of July 2011. 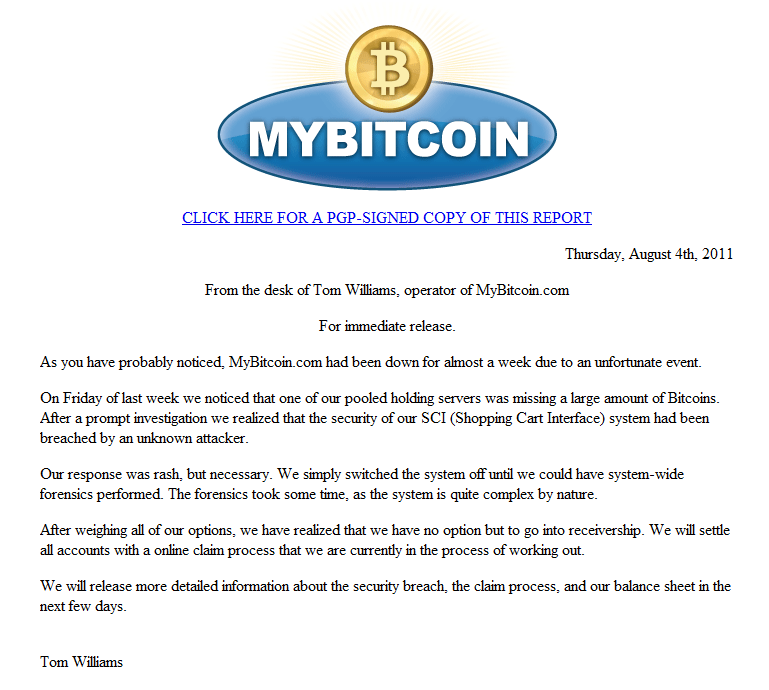 It was available at the URL http://www.mybitcoin.com, as well as via Tor but it has since been replaced with a statement explaining its shutdown. The site became inaccessible starting July 29, 2011. The site has become accessible starting August 4th, 2011 but only to state that their shopping cart interface has been compromised and so they are having to go in to receivership. Soon afterwards, MyBitcoin issued a statement that it had been compromised and that 51% of its total bitcoin holdings had been stolen. It began a process to return the remaining 49% of each customer's balance. This service showed the name MyBitcoin LLC and a mailing address in Nevis. It is not known if this truly is an LLC and if so, where the organization was located. There has been no member of the Bitcoin community who has claimed any affiliation with MyBitcoin. 6.1 MYBITCOIN LLC will ensure that for all Bitcoins in circulation in the MyBitcoin System there is at all times an identical quantity of unencumbered Bitcoins held in MYBITCOIN LLC's master Bitcoin wallet. ↑ mybitcoin down or just me? This page was last edited on 5 March 2013, at 20:24.